There has been a pub on the site of The Bog Irish Bar for nearly 150 years. In April 1864, James Ramage Hood was granted a license for a new public house named the Black Bull Hotel. An early photograph shows it was a single-storey wooden structure. Hood was succeeded as licensee by William and Margaret Carveth (from 1866 to 1877), and Johann Luks (1877-1879). Luks was a German immigrant who had previously worked as a fruiterer in George Street. In late 1878 he commissioned the architect Louis Boldini to design a new hotel building, but was declared bankrupt in August 1879 before the project could go ahead. Daniel White purchased the fourteen-year lease on the property the same month, and in December was granted a license for the establishment which he gave a new name: the Royal Albert Hotel. The replacement building was erected in 1880 by contractor Norman Wood to Boldini’s plans, and completed by October. It was built of brick, with ornate cemented facades in the revived Italian Renaissance style, and made the most of a tricky triangular site. The ground floor had a bar, three sitting rooms, a dining room, and a kitchen. There were nine bedrooms and a sitting room on the first floor. Louis Boldini was the only Italian or Continental European architect who worked in Dunedin in the late nineteenth century, and as most of his work has been destroyed this building is a significant survivor. Boldini’s most impressive designs included the second Dunedin Synagogue, the AMP Building, Butterworth Brothers’ warehouse, and the Grand Hotel. Of these only the Grand remains (as the Dunedin Casino within the Southern Cross Hotel). 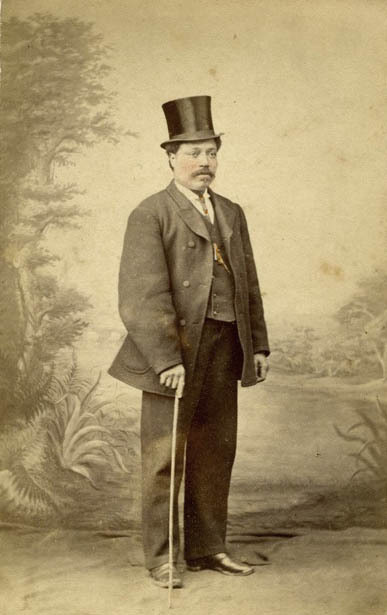 Daniel White (c.1834-1907), known to some as ‘Black Dan’, was born on the Caribbean Island of St Thomas. He arrived in Dunedin in 1859 and initially worked as a barman at the Provincial Hotel. After running a restaurant called the Epicurean, he opened the Crown Hotel at the intersection of Rattray and Maclaggan streets in 1862. He was later the founding proprietor of Royal Hotel in Great King Street, the Queen’s Hotel in Castle Street, and the Ravensbourne Hotel. He was also a West Harbour Borough councillor. Given his surname, his nickname, and his ethnicity, it’s not surprising that White got rid of the Black Bull name! 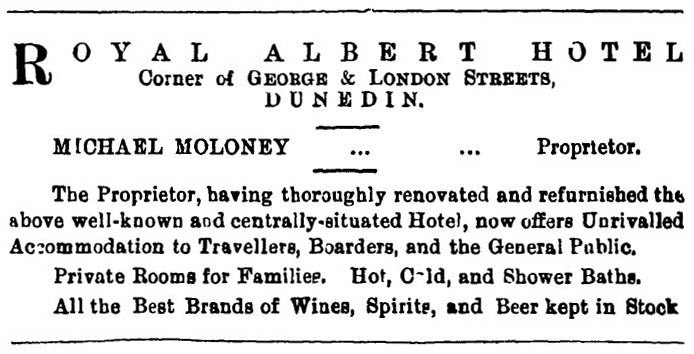 For many years he was one of the most respected publicans in Dunedin, but in 1882 he was refused a renewal of his license for the Royal Albert Hotel on grounds of ‘immorality’. Separated from his wife of twenty years, he had fathered children by two of his servants, one of whom he had been found guilty of beating (for which he was fined one pound). He was forced to give up the Albert, but eventually returned to the Queen’s Hotel in 1888 and remained there for ten years. His last pub was the Duke of Edinburgh Hotel in Russell Street. White died in December 1907 at the age of 73. The Albert passed to Francis O’Kane in 1882, and to Joseph Strong before the year was out. Building additions, again designed by Boldini, extended the hotel in a southwards direction. The next licensees were Robert Allen (1883-1889), Alfred Low (1889-1890), Mary Campbell (1890-1892), and Michael Moloney (1892-1896). The hotel was refurbished during Moloney’s time and alterations designed by architects Mason & Wales were carried out. Moloney was succeeded by John McLeod (1896-1900), Margaret Braun (1900-1904), Thomas Laurenson (1904-1907), Robert McClintock (1907), George McGavin (1907-1911), Michael Cahill (1911-1912), Eliza Cahill (1912-1918), and Sarah Laurenson (1918-1928). The longest serving publican of the Royal Albert Hotel was Henry Mathie Allan, who ran the business from 1928 to 1961 together with his wife, Frances Annie Allan. Above the corner entrance can still be seen the words: ‘H.M. 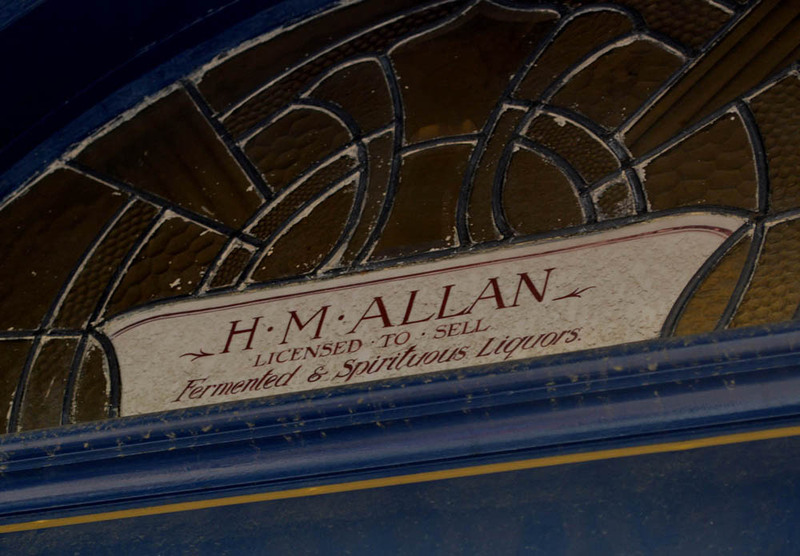 Allan, Licensed to Sell Fermented & Spirituous Liquors’. This wording was uncovered when layers of paint were stripped from the fanlight in 2007. Harry Allan was the son of Eliza Cahill, one of the earlier licensees. He had a keen interest in trotting and owned a number of horses, the most successful of which were Blue Horizon and Will Cary. In Allan’s time the hotel underwent its most radical transformation. The architects Stone & Sturmer (Gorton R. Stone and Frank Sturmer) were commissioned to design extensive internal alterations, a large extension facing London Street, and an art deco makeover of the old exterior. The work was carried out in 1939 by D.P. Murphy and cost £5,443. Stone & Sturmer reworked a number of other nineteenth-century facades in Dunedin during the 1930s, including the Victoria Hotel in St Andrew Street (since demolished) and the Victoria Chambers in Crawford Street. As with Mandeno & Fraser’s remodelling of the Manchester Unity Chambers, previously discussed in this blog, the final result is a marriage of two styles and periods. An Evening Star newspaper report stated: ‘The exterior of the building will be changed to suit present-day tastes with coloured plaster ornaments rising from a brown-tiled base’. Boldini’s ornamentation was removed and plastered over, but the first floor window openings remained and the building retained much of its original rhythm and some of its Victorian character. The new decoration included fluting, floral motifs, and string courses with scroll patterns. Leadlight windows were installed in the first floor and for the fanlights. The ground floor windows were enlarged but mostly filled with glass bricks, the idea being to let light in but keep noise out and the temperature stable. The new private bar was ‘modern to the extreme with colours of black, red, cream, and chromium predominating in a design of sweeping curves and horizontal lines’. It featured a 100-foot continuous counter. The London Street additions were likewise modern in style, with a flat-roofed building erected over the old yard space. View from George Street, August 1963. Reproduced by kind permission of the photographer, Gary Blackman. Edward and Lindsay Young bought the hotel 1963 and remained the licensees to 1977. They gave up the accommodation side of the business and in 1971 the London Lounge bistro opened on the first floor, taking space previously used for bedrooms. A New Zealand Breweries publication reported: ‘The decor shows foresight and courage: a challenging psychedelic (cloth) wallpaper, brightly-hued lampshades, vari-coloured seats, [and] contrasting drapes’. 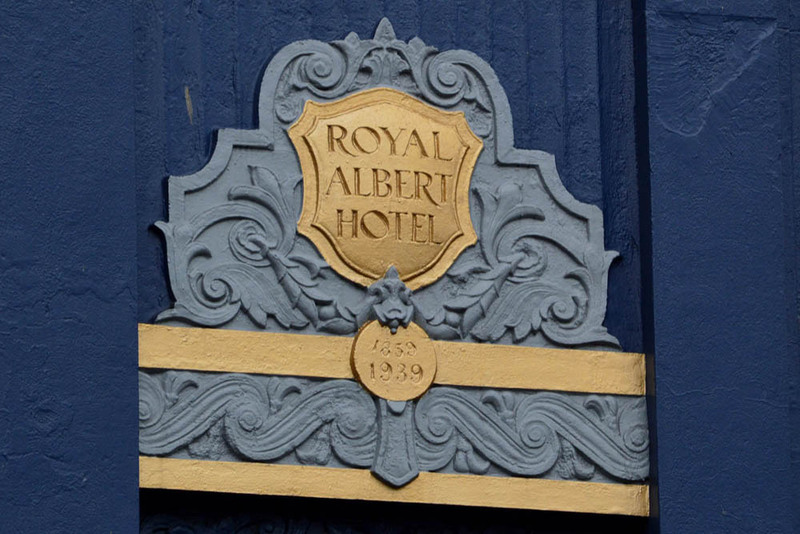 A tavern license was issued in 1978 when the Royal Albert Hotel became the Royal Albert Tavern. The next big makeover came after Michael Bankier bought the tavern in 1988. The Royal Albert was renamed the Albert Arms and given a Scottish theme, complete with Royal Stuart tartan carpet. The menu included ‘Kildonald Fried Chicken’, ‘Loch Lomond Salmon Salad’ and ‘Isle of Orkney Pork Chops’. Loch Lomond is not known for its salmon, nor Orkney for its pigs, but the names were only intended to be fun. 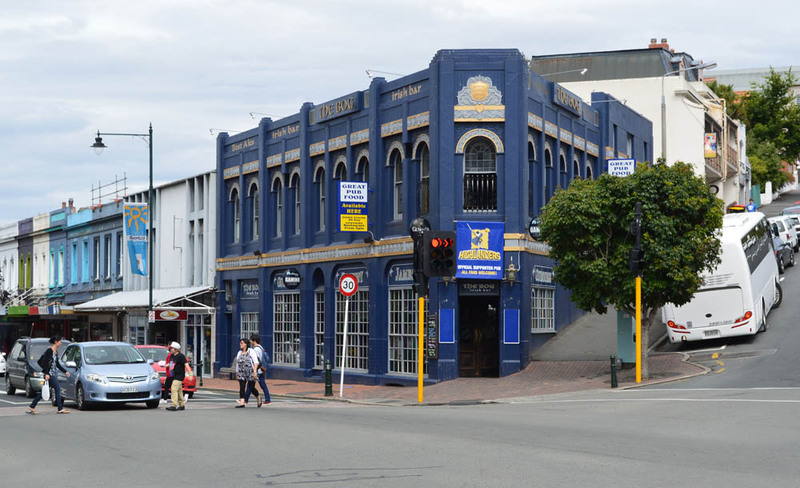 The ground floor windows were reglazed to allow patrons to watch what is one of Dunedin’s most buzzing street corners, and the exterior was repainted in a distinctive green and red colour scheme selected by Peter Johnstone and Sue Medary of the Design Consultancy. The refurbished bar and restaurant opened in June 1989. 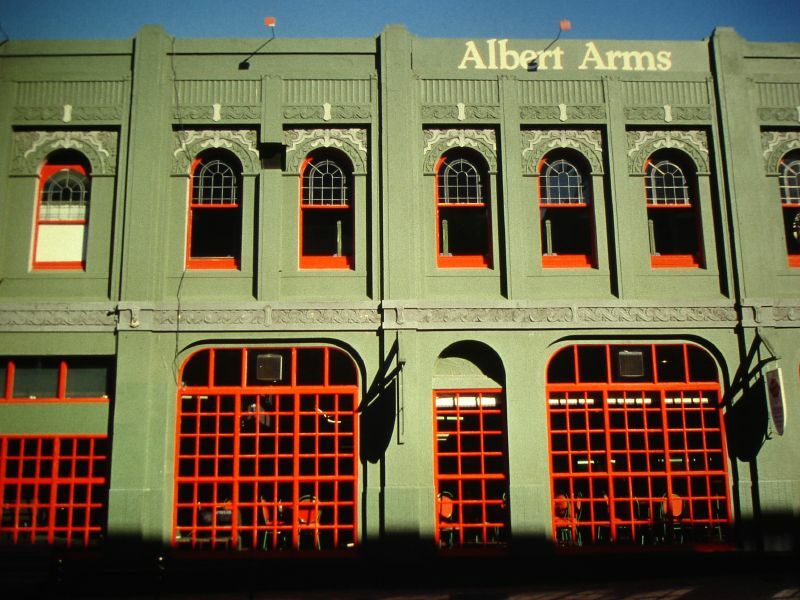 For a short period from 2004 the Albert Arms returned to the ‘Royal Albert’ name and the bar was branded as Albie’s, but the large Albert Arms sign remained on the parapet. 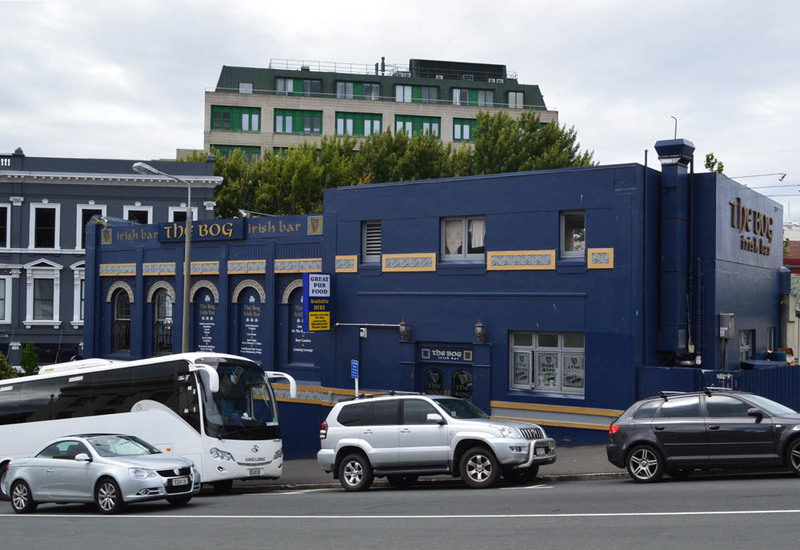 The most recent refurbishment came in 2007, when the Royal Albert became The Bog Irish Bar, one of a chain of four bars in Auckland, Christchurch, and Dunedin. The exterior was repainted blue, with gold and grey detailing. The London Lounge closed but a new restaurant was later opened in the space. Steel grilles were added in front of four first floor windows and a variety of textured and coloured glass panes installed in the existing ground floor windows. There are many appealing features, but to me it’s a pity that the old name has gone and there is no celebration of the site’s own 149-year history amidst the large amount of generic Irish history that decorates the interior. There is a curiosity in the exterior plasterwork in that two dates, 1859 and 1939, are engraved on the parapet. The second commemorates the rebuilding, but the first is something of a mystery. The original 1880 decoration also featured the 1859 date. The site was first licensed in 1864, so is the reference to 1859 a mistake? Was Dan White referring to the year he first arrived in Dunedin? Or was there some other business on the site from this date? It’s something to ponder – perhaps over a beer! Newspaper references: Otago Daily Times, 20 April 1864 p.4 (Black Bull Hotel), 15 June 1864 p.4 (Black Bull Hotel), 12 August 1879 p.1 (bankruptcy of Luks), 23 August 1879 p.4 (sale of hotel), 3 December 1879 p.3 (transfer of license), 13 May 1880 p.2 (White in City Police Court), 5 October 1880 p.2 (description of new building), 19 June 1882 p.2 (White’s license), 25 July 1882 p.2 (additions), 3 April 1894 p.3 (alterations by Mason & Wales), 23 March 1911 p.12 (‘Black Dan’), 25 March 1961 p.2 (hotel sold), 19 June 1961 p.3 (retirement of Harry Allan), 14 June 1989 p.21 (refurbished as Albert Arms), 24 May 2007 p.10 (refurbished as The Bog Irish Bar), 18 October 2007 p.22 (The Bog); Evening Star, 31 December 1878 p.1 (call for tenders), 31 July 1882 p.2 (additions), 21 March 1939 p.3 (description of rebuilding); Otago Witness, 6 September 1879 p.15 (sale of hotel). Dunedin City Council permit records and deposited plans. Frank Tod papers, Hocken Collections Uare Taoka o Hākena MS-3290/049. McNeish, James. Tavern in the Town (Wellington: A.H. & A.W. Reed, 1957). Tod, Frank, Pubs Galore (Dunedin: the author, 1984). This entry was posted in Architects and tagged 1880s, 1930s, Art deco, D.P. Murphy, Daniel White, Facelifts, Frank Sturmer, George Street, Gorton R. Stone, Hotels, Louis Boldini, Norman Wood, Renaissance revival, Stone & Sturmer on 14 May 2013 by David Murray. I love it when a story follows the continuous transformations of a place or building. This one certainly has a lot! I enjoy that aspect a lot too. I saw some 1980s drawings for yet another proposal for this building that never came to fruition. I think the 1971 alterations may well have been an EJ McCoy design. Thanks for that info. The DCC have deposited plans for the alterations (H-1971-73286) but I didn’t look at them. I am distantly related to licensee Margaret Braun, who was also Margaret Vannini and Margaret Moloney, and probably sister to Michael. You spell his name Maloney, as several histories do, but the newspaper advertisement you display shows that Michael (and Margaret) spelled their name Moloney. I am trying to establish whether the former Waverley Hotel in Moray Place, which Damiano Vannini was licensee of at his death in 1891, with the licence taken over by his widow Margaret Braun, still stands. Is it ‘The Break’ bar at 1 Gt King St, do you know? Hi Stuart – I’m sorry about the spelling mistake. There are many spelling errors in the existing licensee lists and I had checked and altered some of the other names but missed that one despite the newspaper notice. The Waverley Hotel no longer stands. 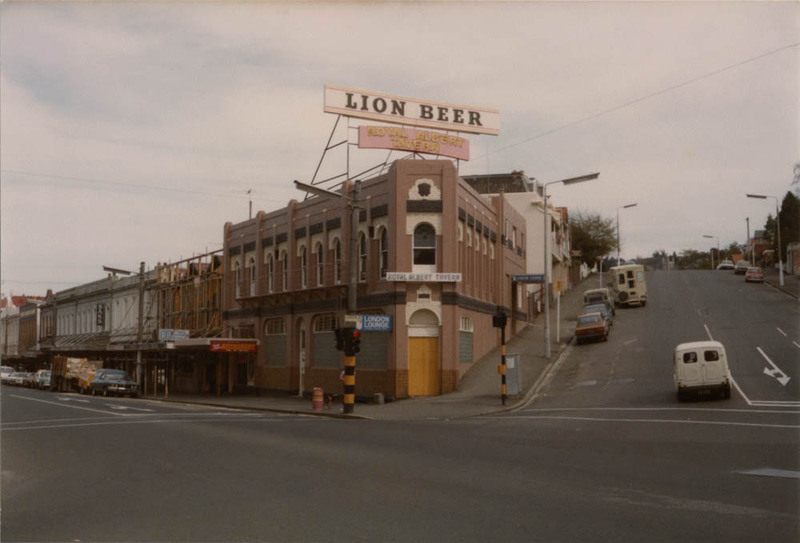 I think it was demolished in the 1960s when the Otago Savings Bank (now Westpac) building was erected. You can see the old hotel in various photographs. 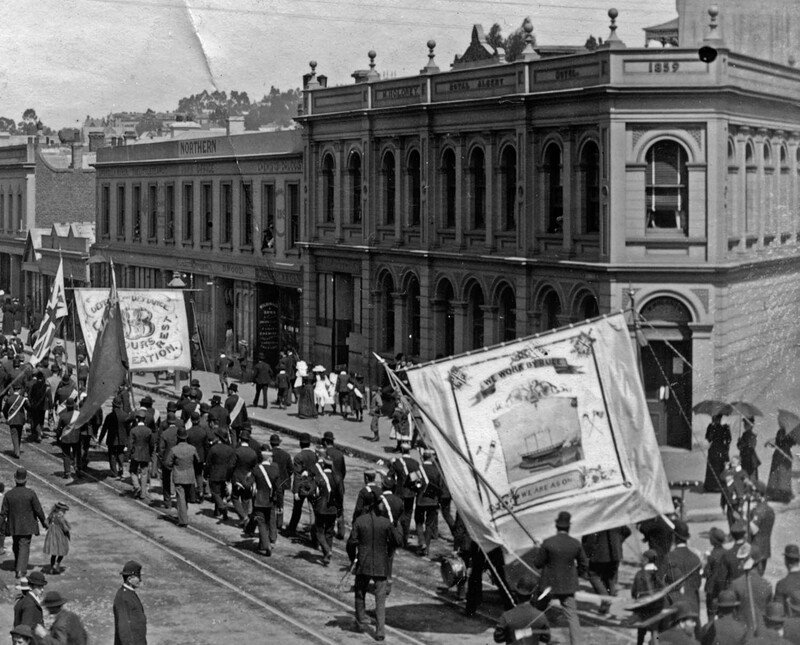 If you go to the image on the Te Papa website at http://goo.gl/jUvZeQ you will see it at the bottom far right with the name clearly displayed (click on the image and use the zoom slider). Thanks for that, David. 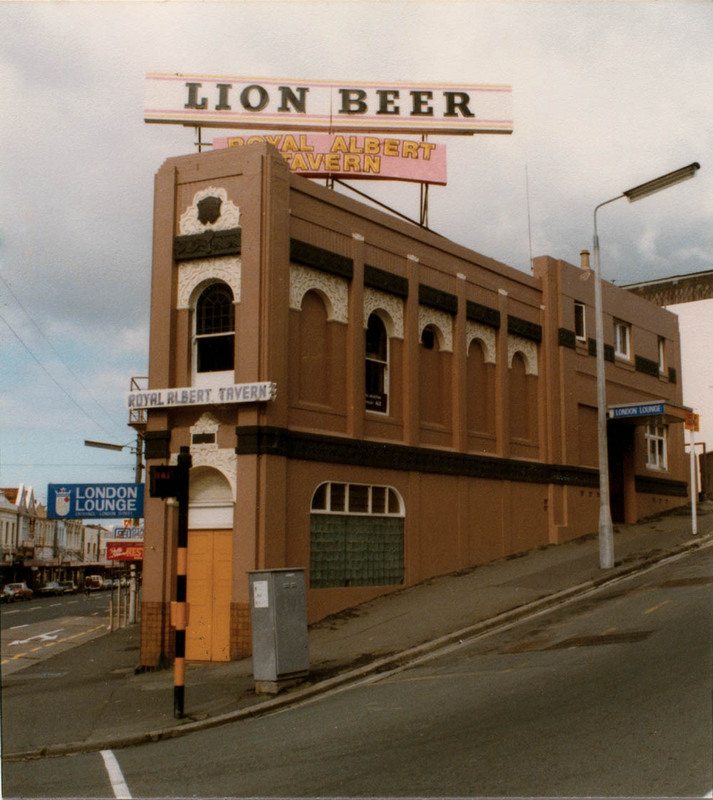 I was put on the (false) trail by the statement in Frank Tod’s Pubs Galore that the Waverley building still stood (in 1984), but it would seem he was wrong, since as you say the demolition was well before then – I lived in Dunedin in the 1960s, so I might have seen it, but who knows! Thanks for the photo reference – yes, the name stands out very clearly. You’re welcome Stuart. Tod’s book is very useful but I treat it a little cautiously. For his licensee lists he seems to have taken and expanded the similar lists complied by R.W. 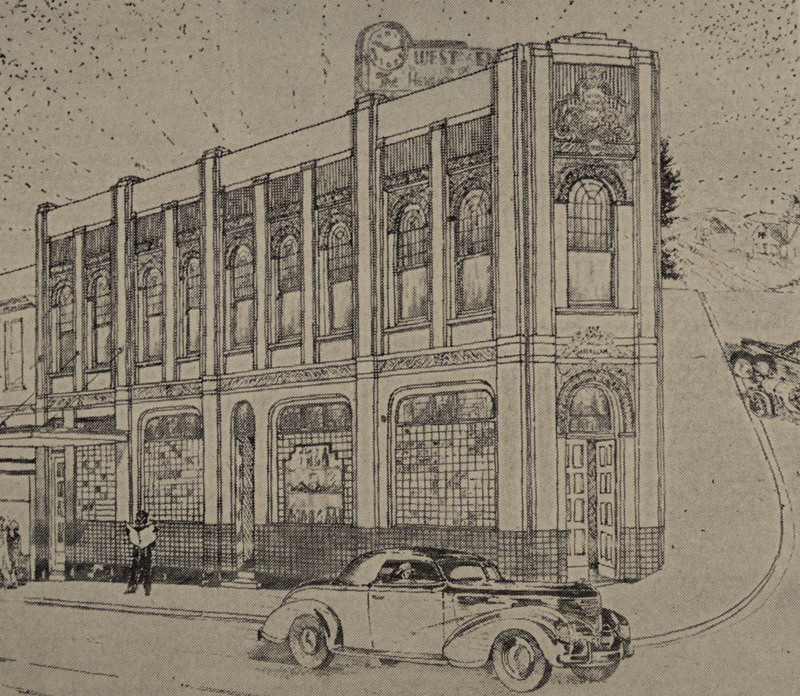 Willett (1937), which were published in sheet/poster form as ‘Hotels of Dunedin: Historical Record’. It seems a pity that Willett never seems to get any of the credit. Best wishes with your research. Looking it over more carefully, I think Tod was correct that the building was standing in 1984. The OSB tower opened in 1968 but it has a smaller (approx 1992?) addition that seems to be on the Waverley Hotel site. Hi Stuart. I am a relative of William Obren who was also owner of the Waverley Hotel before your relative.The Break Bar is certainly not the old Waverley Hotel. The Waverley hotel has been demolished a while now. It used to sit on the site which is now part of multi story building which takes up the corner of Moray Place and George Street. I in fact have a photo which shows the Waverley Hotel just after 1900. It is in a photo in Te Papa’s website. Go to http://collections.tepapa.govt.nz/Object/195386 and you will need to zoom in on George Street close to the Octagon on the bottom right of the photo. You will see the writing ‘Waverley Hotel’ on the second story of the hotel! If you don’t zoom in you probably wont make it out. I was so astounded to find it! Thanks Brent – it’s great when these family connections come through. I’m researching my family tree and saw your comment. James Ramage Hood was also my great great grandfather. I would love to know where you found a photo of him and any other information you have regarding the Hoods/Taylors. Stacey if you send me an email to taylorfamilyhistorynz@gmail.com I will be able to provide you with a lot of information. Thanks for the added information, Grant Cooper, and the link to a better resolution image than I had seen before. The Waverley was where its licensee, my great great grandfather Damiano Vannini, Margaret Moloney’s first husband, died in 1890, so it’s great to have a photo. Joining this thread very late but just found out that my grandfather was proprietor of Royal Albert in 1907. No one in my immediate parential family mentioned this to me and we lived in Dunedin. Had numerous beers there during varsity days !! One Robert James McClintock also had very long links the The Vulcan (formerly Ballarat Hotel) St Bathans as well as the Bendigo in Alexandra. I’m putting and extensive story book together for my family so this article and info is extremely valuable. Great family link – thanks John. Glad the info is helpful. I had a Royal Albert old vintage 750ml bottle of sherry no44 of a limited series of 293 bottled by Powley & Co Dunedin NZ which broke in the Kaikoura earthquake the seal intact, can you tell me the story behind this and its value today? Sorry, I don’t know much about either their bottling or brewing activities but Powleys were around a long time. From a few secondary sources I’ve looked at it seems they were bought out by New Zealand Breweries in 1958 and then continued as a subsidiary. I would have no idea about the value of the bottle as that’s a long way outside my area of expertise – what a pity it was broken. I finally got around to adding a great reference from James McNeish’s ‘Tavern in the Town’ about Allan and his toby jugs. Am doing research on a family member on my husband’s side and his name was Robert Maxwell whose address in July 1879 was Preston House, George Street, Dunedin. The address was referenced in letters to his mother and someone named ‘Lizzie’ that he signed ‘from your loving brother’… Perhaps there were others there with his family, some of whom were either Thomson or Thompson. Any idea where I might search? Thank you for your time.